Fri, Feb 26 at 8 p.m. Sat, Feb 27 at 8 p.m. 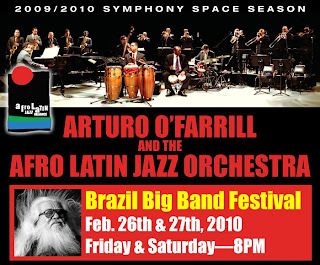 The Afro Latin Jazz Orchestra goes Carioca! Featuring guest Music Director Cliff Korman and friends -- the evening will be a celebration of the Samba, the Bossa Nova, and other Afro Brazilian rhythms. We will explore the genius of Hermeto Pascoal and feature special guests Vanderlei Pereira and Paul Leiberman and more!